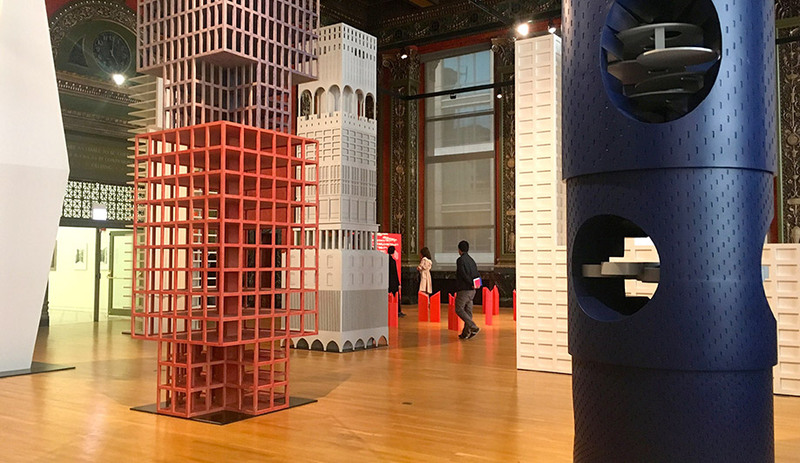 The Chicago Architecture Biennial 2017, North America’s largest architectural exhibition, has opened its doors to the public. The event’s second edition includes over 140 participants; here’s what to check out. Some 140 participants from around the world make up the second installment of the Chicago Architecture Biennial, a multi-venue display of contemporary architecture that opens Saturday and runs until January 7, 2018. 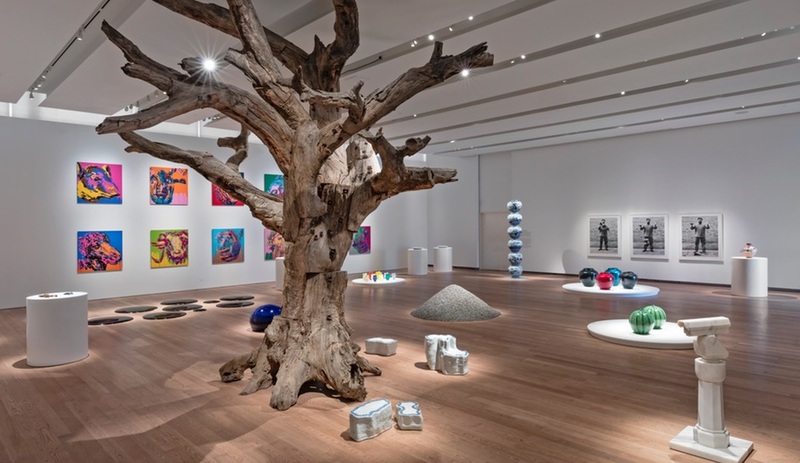 The main event is at the Chicago Cultural Center, where the exhibit Make New History winds its way through various dome-ceiling rooms and narrow hallways on three floors of the neoclassical building. 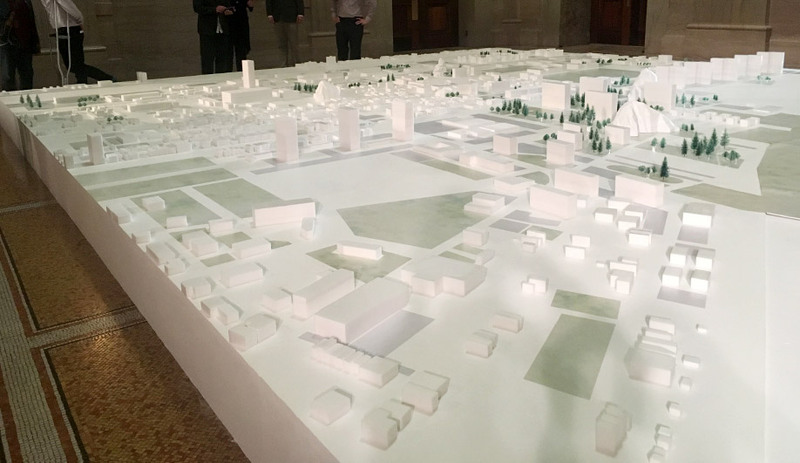 Filling one entire room is a model of the Illinois Institute of Technology and the surrounding residential streets and mid-rise buildings. Last year, the school invited SANAA to come up with a campus expansion plan. The Japanese firm came back with the idea of inserting a series of boulder-shaped glass buildings somewhat randomly on campus and beyond. 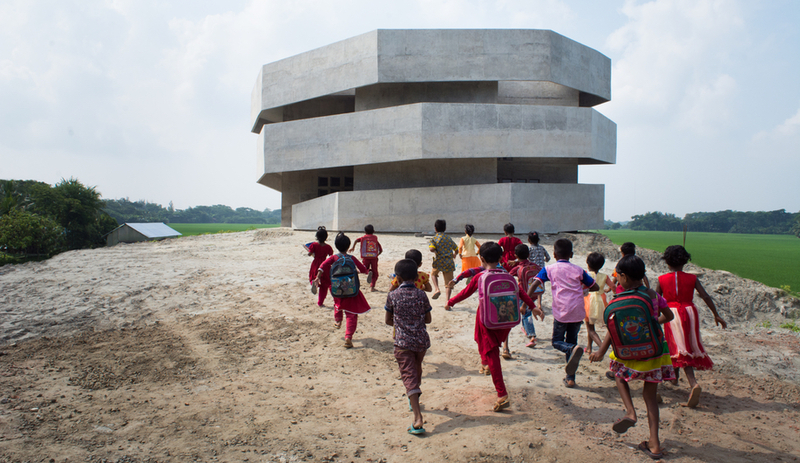 The asymmetrical buildings would break up the district’s rigid street grid and physically unite the school and residence. This is the first time the proposed plan, executed with IIT students, is being presented publicly. It will give Chicagoans a chance to weigh in on the plan at its infant stage, and introduce the idea of breaking down the usual divides between campus and community. 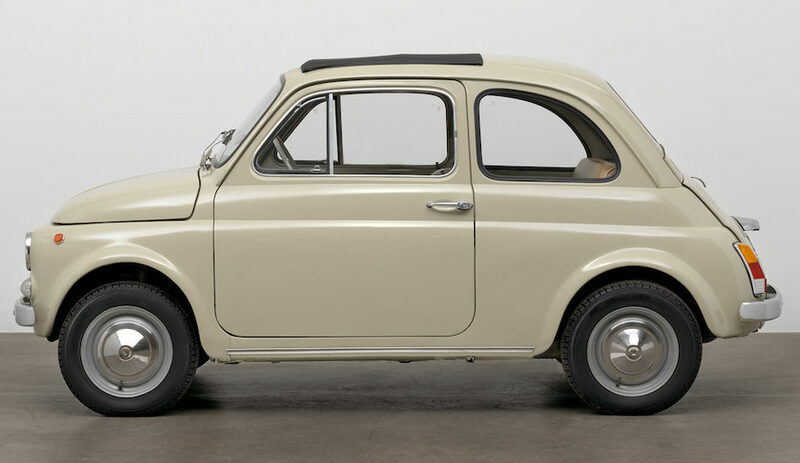 The Barcelona studio took a page from French conceptualist Marcel Duchamp whose Paris apartment had a paradoxical door which served two adjacent entrances – an oddity that meant only one passageway could be closed at any given time. MAIO wondered, what if a house had only doors but no walls? Would the act of simply opening and closing a door suffice as a physical divide? 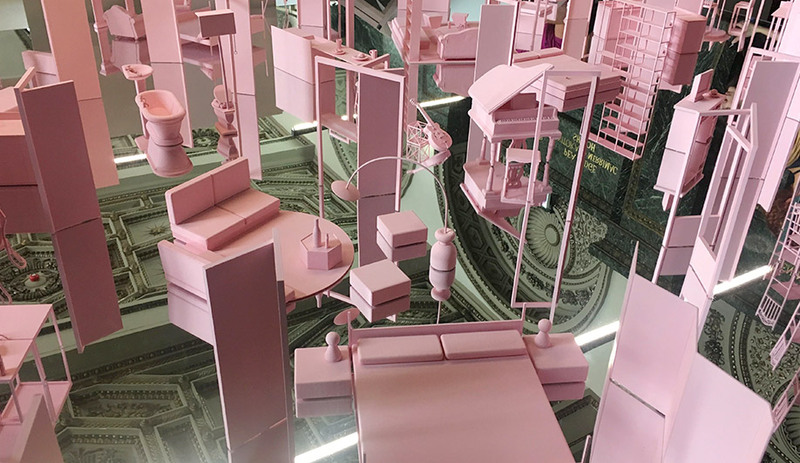 Their all-pink suite made of tiny pieces of furniture shows how doorways delineate interior space. More poetic than practical, The Grand Interior is a study on how furniture groupings (the living room set, for instance, or kitchen table and chairs) have their own organizational principles that make walls far less important than you’d think. Anyone who has spent time in Milan will recognize the material base of these furniture pieces by Piovene Fabi and Giovanna Silva. 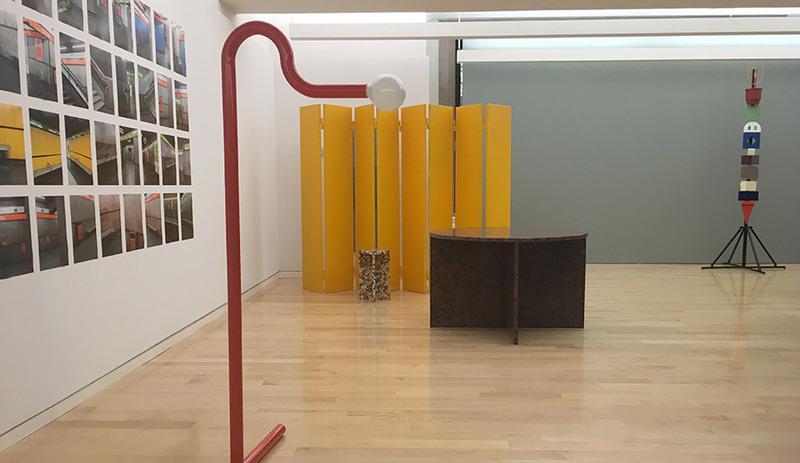 The duo created a floor lamp, table and screen divider using a palette of orange metal, stained concrete and Pirelli rubber – the same materials adopted by the city’s first subway station line, M1, also known as the Red Line. Built in the 1960s, when Italy was brimming with optimism, the underground metro was a symbol of progress during an era when design and engineering were valued in equal measure. Called Metropolitana, the pieces pay tribute to Milan’s respect for good design no matter how utilitarian the application might be. 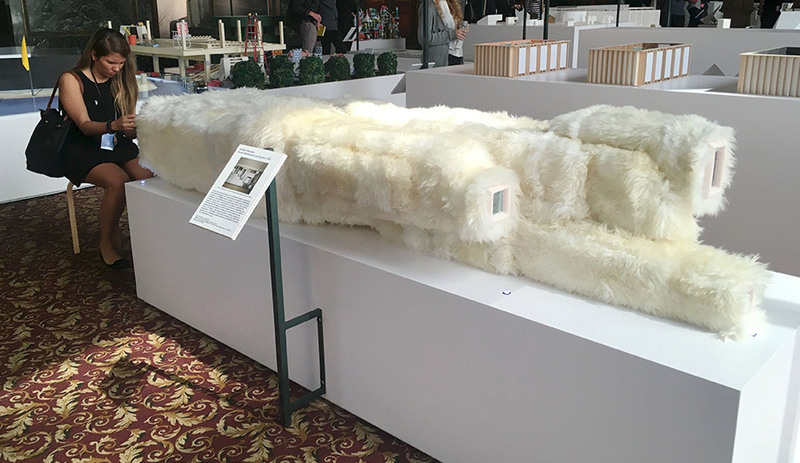 Wrapped in yards of white fun fur, Another Raumplan is a miniaturized interpretation of Villa Müller, Adolf Loos’s 1930s house built in Prague. 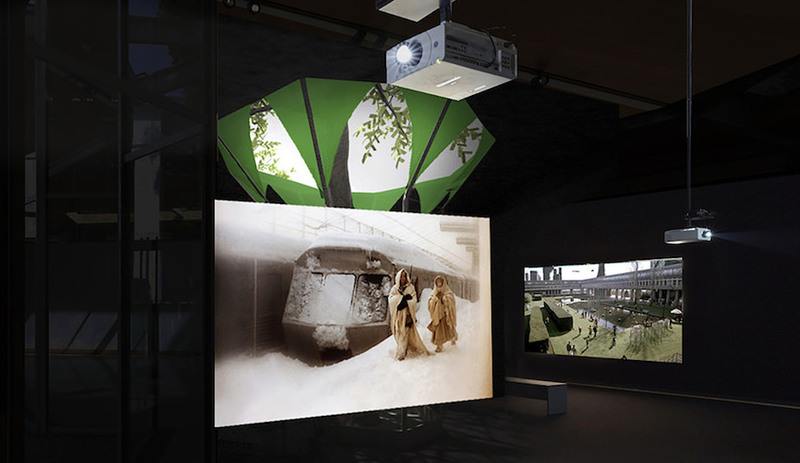 The house became the subject of a famous 1992 book called Sexuality and Space, which brought to light ideas about interior spaces as places to view and be viewed. Bureau Spectacular, based in L.A., picked up on that idea with a maquette where you can see inside at one end of the house, but not the other. We’re not exactly sure what this might mean, but the firm thinks there may be something that might be illuminated from this selective voyeurism that could lead to the creation of ungendered interiors. 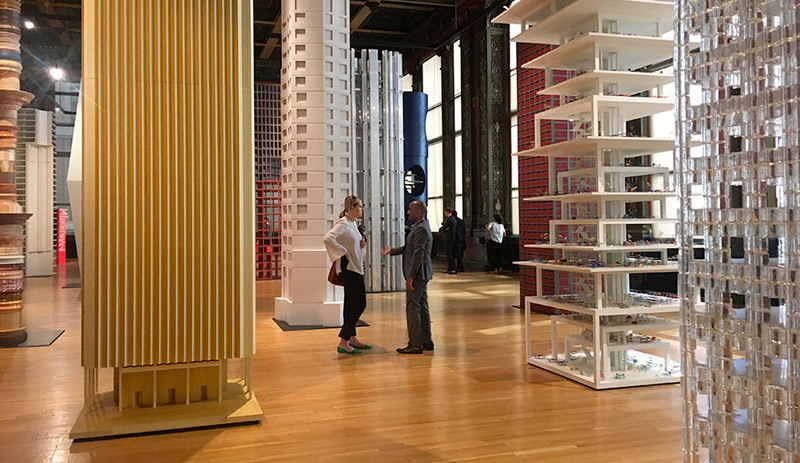 Vertical City is a highlight of the exhibit, featuring a spectacular display of 16 interpretations of the Chicago Tribune Tower. The participating architects (including Diébédo Francis Kéré of Berlin, Tatiana Bilbao of Mexico and Sam Jacob from London) were asked to respond to the brief for the competition, originally held in 1922, to and design their ideal Tribune Tower. The results are wildly different from one to the next. Éric Lapierre Architecture proposed a simple poured-in-place column tower while Kéré’s Tower of Babel is an indigo-hued tower in the round with giant Swiss cheese holes punctured throughout. The Burkinabè architect imagines these big holes as places where markets, parks and shopping malls could be nested all the way up the tower. The Chicago Architecture Biennial runs until January 7, 2018.